Memorials honouring lives lost to homelessness are turning into a growing grassroots movement fighting stigma and calling for action on homelessness to prevent this needless loss of life —and these communities need your help. Every time a homeless person met with an untimely end, Cathy Crowe was one of the many people knocking on the glass windows of the Toronto mayor’s office. The mayor had to acknowledge the homeless death at his doorstep. It had to stop. But this was in the late 1990s when homeless deaths were few and far between according to Cathy, a Street Nurse and Distinguished Visiting Practitioner in the Department of Politics at Ryerson University. “Back then, when a death did happen I usually knew the person. It would be a shocking death,” she notes. “Any death is tragic but often it was quite violent—decapitated by a train, burned to death by a fire. People were enraged and would often go to city hall and make different demands for more shelter or more outreach,” she says. The knocking stopped when the deaths amplified to such a frequency that no one could keep showing up to city hall demanding action every time. They were busy being overwhelmed by the constant need and work attached to the rising homelessness crisis on their streets. 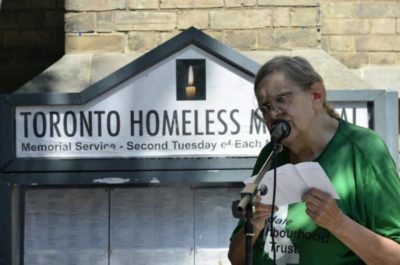 In response, Toronto became the first city to hold a homeless memorial, which was founded by the late and beloved homeless advocate Bonnie Briggs. Since 2000, the second Tuesday of every month at noon, anywhere from 30 to 50 (and sometimes even 100) people collect on the south-facing steps of the Church of the Holy Trinity to remember the people whose lives were dramatically cut short by homelessness. No matter the weather, the two to six deaths on the list are heard including when and how they died, followed by a moment of silence. People are encouraged to speak if they knew them and share memories with the crowd. It’s followed by some community announcements and then people go inside to share a hot lunch. The average age of death is 49, according to Cathy, and they are mostly preventable. From January 2017 to June 2018, 145 people have died, which is the latest available data. “We didn’t always have this high number of deaths,” Cathy says. They also have a physical memorial listing all the names of the people who have died behind a pane of glass, which helps visualize that the city at one time did not experience such a tragic number of deaths as it does today. Toronto is joined by Edmonton, Winnipeg, Kitchener and Waterloo, London, Calgary and a few other communities who have or are working on similar projects to honour the lives lost to homelessness—for the friends, family, patients, clients, neighbours and so many others they left behind. Suzi Gursoy knows how severe it is to be homeless and on the street. “I was homeless,” she says. “People need to understand there is a harsh reality that you can die on the street. Gursoy is part of a growing movement of people fundraising for the KW Homeless Memorial for the Kitchener and Waterloo Region. The group, comprised of volunteers from a variety of social agencies, are proposing for the “Between a Rock and a Hard Place” memorial with a $25,000 price tag (pictured). So far, the project has been given a grant of $7,700 from the Region of Waterloo Arts Fund. Gursoy hopes to see the statue erected in Kitchener’s Victoria Park because a lot of the homeless population hangs out there. “We want to raise awareness about homelessness,” she says. “To somehow change the stigma. People tend to just walk by you like you’re nothing. Calgary is also fundraising for a Homeless Memorial Project—a public space to honour the community members who died while experiencing homelessness. 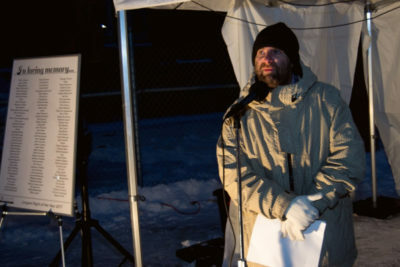 Right now, the Calgary Homeless Foundation organizes an annual memorial event on winter solstice, The Longest Night of the Year. During the last one in December, 133 names were read out loud on the steps of Calgary’s downtown municipal building. The memorial project would be a permanent structure. It’s being organized by the Client Action Committee and Calgary Homeless Foundation. They’re hoping to have a monument or permanent structure, a bench where people can rest, and a commemorative plaque. “Many people who experience homelessness are disconnected from their biological families, and the relationships that are formed and sustained on the street can become as important, or more important, as their families. When someone loses a member of their street family, the personal and community loss can be devastating,” the GoFundMe page states. Back in Toronto, Rayna Slobodian volunteered to pull the names from the memorial outside the Church of the Holy Trinity to digitize them and share them at homelessmemorials.com. It’s an online record to help the public understand the scale of the issue. It took her months to put the website together because she took the time to make sure she’d get it right. She wants people to see the website and take away two main things: they’re human being and this is a crisis that must end. It’s an opportunity for people who can’t physically make the monthly memorial to have a space to remember the people who passed. “It’s important to recognize their names because it also humanizes people,” she adds. The website also includes a section on how to help, writing to your MP and other action points people can take. Does your community have a memorial? 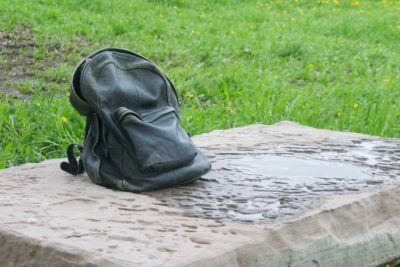 The Canadian Alliance to End Homelessness wants to know if you have a homeless memorial in your community so we can help spread the word. If you’d like to start one, Rayna says it’s about getting the community involved, finding a central, accessible location and then working with organizations and advocates to collect the names of the people who have died due to homelessness.